In the end, Tuesday’s milestone 100th day of demonstrations against the Quebec government’s proposed tuition hikes encapsulated the very best and worst of the three-month-old standoff. By day, the march, which drew a crowd that was estimated at anywhere between 100,000 and 250,000 people, was peaceful, almost festive, with colourfully clad protestors walking through the city’s downtown core singing, dancing and chanting anti-government slogans. While there were a few reports of minor property damage, the demonstration was all but free from the violence and vandalism that has marred similar gatherings in recent weeks. In the end, Tuesday’s milestone 100th day of demonstrations against the Quebec government’s proposed tuition hikes encapsulated the very best and worst of the three-month-old standoff. By day, the march, which drew a crowd that was estimated at anywhere between 100,000 and 250,000 people, was peaceful, almost festive, with colourfully clad protestors walking through the city’s downtown core singing, dancing and chanting anti-government slogans. While there were a few reports of minor property damage, the demonstration was all but free from the violence and vandalism that has marred similar gatherings in recent weeks. However, the nighttime demonstration, which left from Parc Émilie-Gamelin, grew ugly soon after the police declared it illegal because organizers had contravened freshly minted Bill 78 by not submitting the march’s route beforehand. Police also maintained they were pelted with projectiles, including bottles, and that a number of protesters had broken the city bylaw prohibiting masks during demonstrations. At approximately 9:45 p.m. Sûreté du Québec officers in riot gear dispersed a crowd gathered on Ste. Catherine St. near Crescent. By night’s end some 100 arrests had been made and a half-dozen people were injured, including two police officers. Originally, Tuesday’s demonstrations were supposed to mark the 100th day of tuition protest – already the longest such protest in Canadian history. But with Premier Jean Charest’s government passing emergency legislation in the form of Bill 78 on May 18, the protest seemed to gain momentum, with many people joining student ranks to decry what critics say is an anti-democratic crackdown on the right to assembly and to express oneself. Under Bill 78, organizers of demonstrations are required to submit their itinerary at least eight hours beforehand for approval by police. The Bill also prohibits protest or picketing on or near university grounds and also places restrictions upon the right of education employees to strike. Individuals and groups that disobey the law can be subject to substantial fines. Ironically, the Bill, though tough on paper, may prove difficult to enforce – as was witnessed during Tuesday’s afternoon demonstrations. 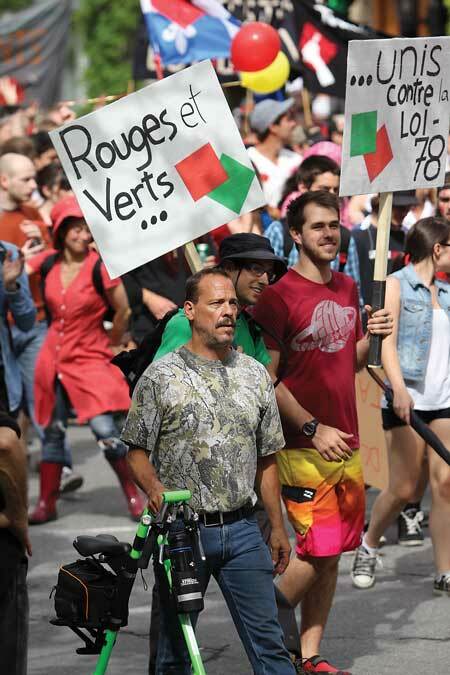 While many marchers complied with Bill 78 by sticking to the designated route, a massive group broke off and headed west along Sherbrooke St. From there, more splinter groups formed and followed their own paths until the downtown core was awash in a sea of red and effectively shut down to traffic – further angering local merchants, many of whom have said officials aren’t doing enough to protect their businesses. Dutil acknowledged that the controversial Bill may have given protesters some momentum going into the summer – traditionally a quiet period for students – but he stressed that, in the end, cooler heads must prevail. “We currently have a very bad polarization of the situation meaning that some people are very much against the law while others are very much for it.… So we must appeal for calm from those who believe in a society, in a mature democracy such as Quebec,” Dutil said. The blatant disregard of Bill 78 and various court-ordered injunctions to allow access to classes for students who want to finish their studies this semester has been one of the primary sources of tension between student leaders and the government. Education Minister Michelle Courchesne, who replaced Line Beauchamp on May 14 after the latter resigned, told reporters while she is always ready to negotiate, she doesn’t have much faith that the same can be said of student leaders like Nadeau-Dubois.